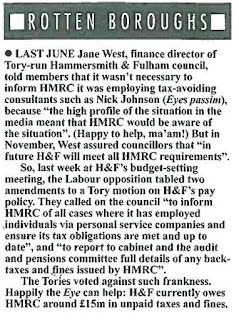 Private Eye magazine is second to none at investigative journalism and has led the rest of the media on the latest breaking story concerning oganisations flouting UK tax laws by identifying what's happening with our own Conservative run H&F Council. 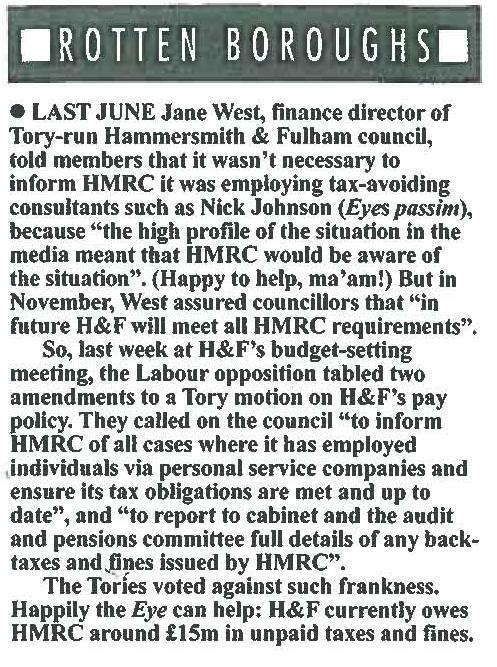 Here's a selection of clippings demonstrating their most recent coverage of H&F Council's tax woes. There's also a story about the foul-mouthed ranting of a leading local Conservative councillor in the second clipping. To read the stories each featured in issues 1307, 1308 and 1309 respectively, please click on the picture to expand it.